This one via Arch Daily is quite odd... 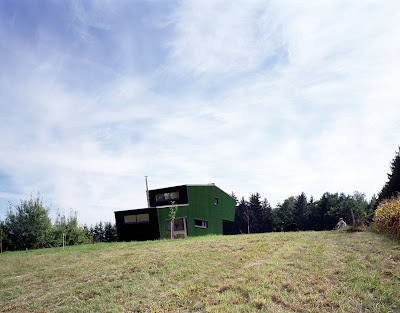 I'm strangely fond of the form of the Amalia House by GRID Architects in it's very modern form, as well as the verdant color of the building skin. I was also mesmerized by the glowing green facade - and wondering, maybe, if it was something vegetal. Via Arch Daily: "To give tribute to the nature around her and maximize the interchange between inside and outside, the house is completely covered with artificial grass -with only the windows left out. 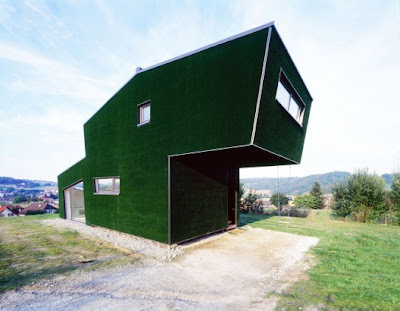 ... Amalia is the first artificial grass camouflage building in Austria." Tribute to nature huh? 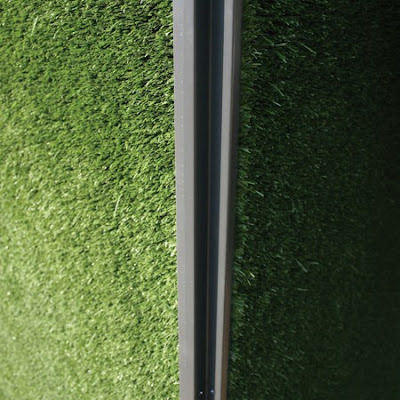 Well... artificial grass is neither natural nor terribly sensitive, made up of such natural materials as polyethylene and nylon... While perhaps it is somewhat blended with it's environs, and perhaps some landscaping in the building site would be a bit more of a 'tribute'. Like I said, I really like the form - and love the soft velvety green surface... but something rings a bit wrong with this one.